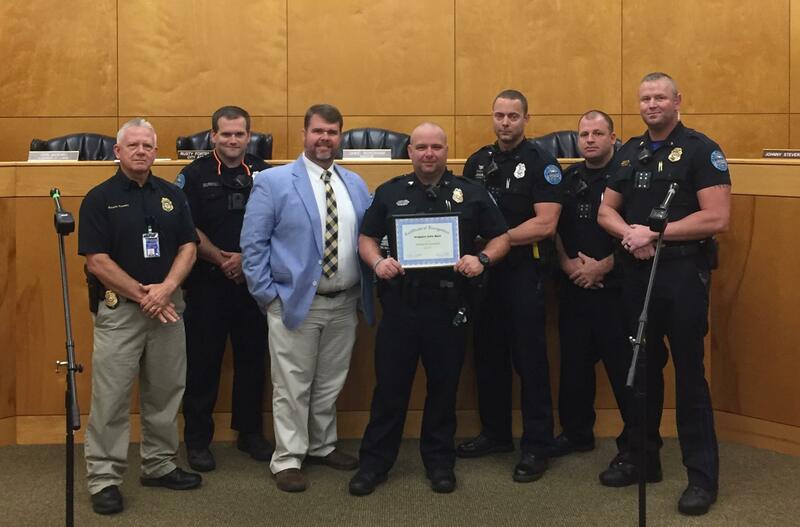 We are proud to announce that the Pearl Police Department Officer of the Month in July is Sergeant John Burt. Sgt. Burt is a Pearl High School graduate and began his law enforcement career as a Reserve Officer in 2001. He began as a Dispatcher in January 2012 and graduated from MLEOTA in June 2012. He was promoted to CID in March 2015 and to Sergeant in 2016. In the spring of 2017 the Pearl City Park had been vandalized numerous times. Lt. Jerry Adair’s shift took that as a p...ersonal insult and took action. Sgt. Burt organized heavy surveillance of the park and ball fields with personnel in key observation areas. Through perseverance and dedication to the case, Sgt. Burt and fellow officers were successful in using shoe prints to identify the suspect, who later confessed to the vandalism. This is just one example of Sgt. Burt’s tenacity in getting cases solved. His tireless work ethic, professionalism and loyalty to the city of Pearl make him a valuable asset to our department. The entire shift of Sgt. Burt, Officers Glen Westbrook, Heather Rodgers, Robert Washington, Kyle Camardelle, Tyler Burnell and Mike Hollingsworth were all a part of this successful mass effort. The Pearl Chamber of Commerce presented Sgt. Burt with a framed certificate, a $100 Bass Pro Shops Gift Card and a Cracker Barrel Gift Basket along with a complete meal for two. Bullock Investigations and Security donated a $25 Buffalo Wild Wings Gift Card; Moss Creek Fish House donated a $25 Gift Card; The Pearl Municipal Credit Union donated a $25 Visa Gift Card; Scotts Miracle Gro donated a Fit Bit; McAlister’s Deli donated two complimentary meals and Signmark donated a duffel bag.